This autumn quinoa salad with maple balsamic vinaigrette is a delicious way to transition your recipe repertoire from fall to summer; warm and packed with hearty, autumn flavours yet still light and fresh-tasting. Summer is officially over! As the weather changes, so do our palates. The fresh, cool breeze that welcomes autumn inspires me to prepare more hearty, full-flavoured meals for the family, such as soups and stews. 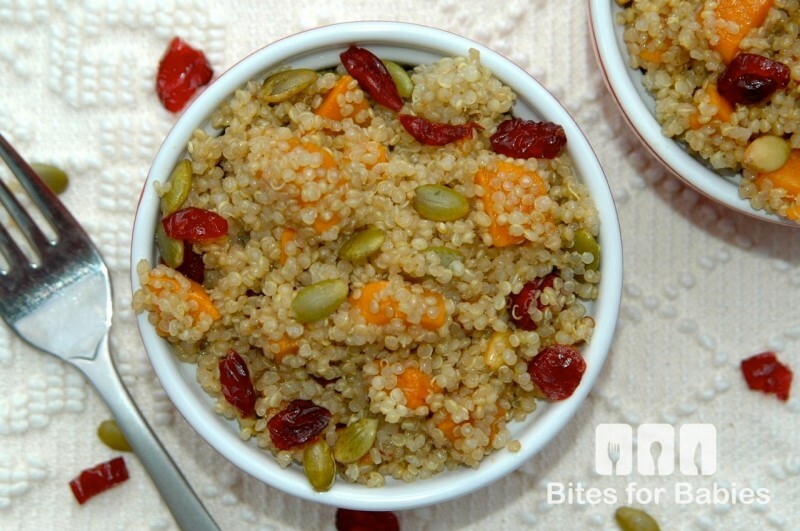 The combination of flavours and textures makes this quinoa salad a delicious intro to fall, with its nutty quinoa, sweet chewy dried cranberries, crunchy pumpkin seeds, and creamy sweet potatoes. 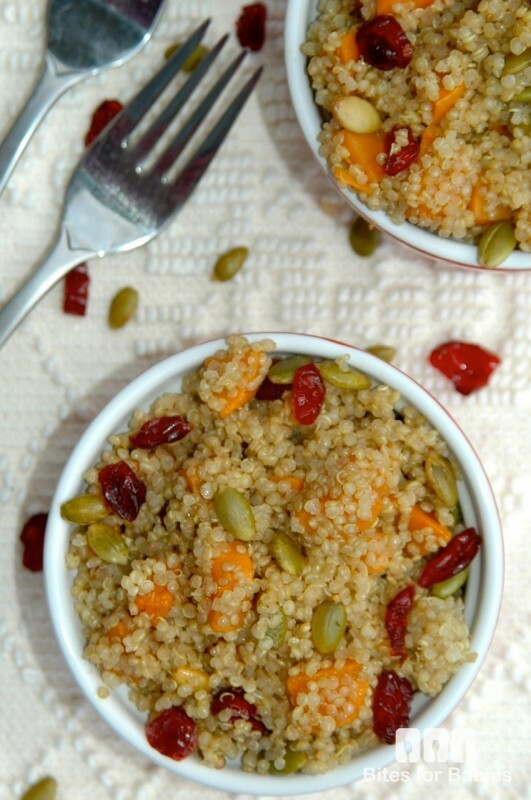 The simple vinaigrette adds tang and sweetness, and the quinoa is the perfect grain to absorb all that deliciousness! While the pumpkin seeds and cranberries may not be ideal for young toddlers and babies, they can easily be added after setting their portion aside. 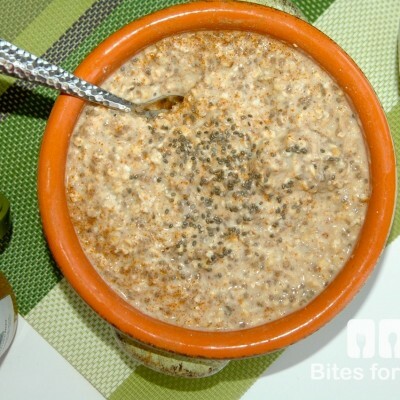 You could also up the health factor and create more texture by adding crunchy chia seeds. Prepare the quinoa and set aside to cool. 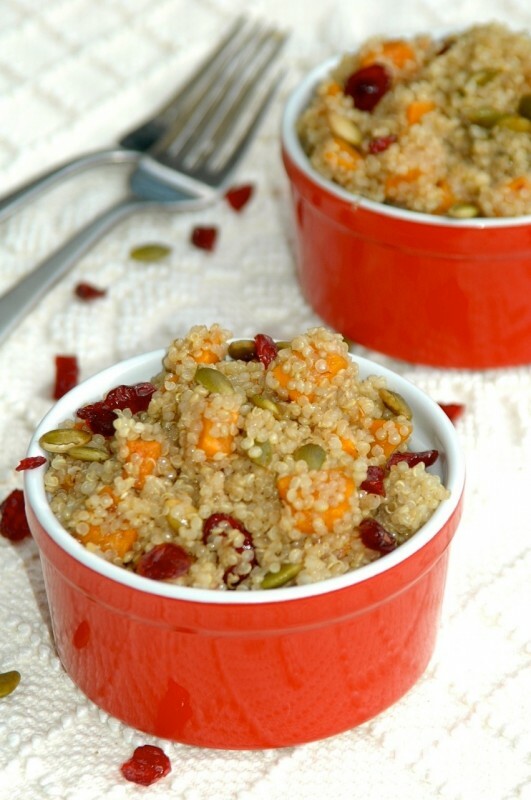 *I often prepare the quinoa ahead of time (usually the night before) to reduce the prep time on the day of. Heat the olive oil in a large frying pan on medium heat for 1-2 minutes. 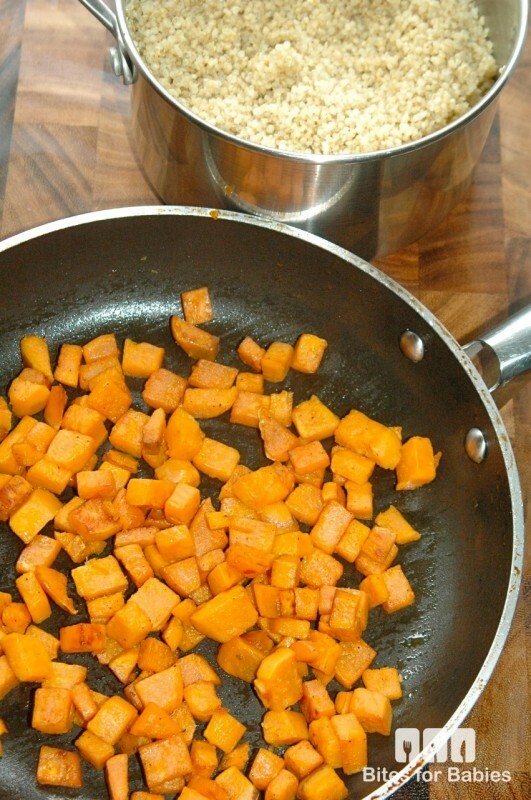 Add the cubed sweet potato and cook on medium heat for 20-25 minutes or until fork tender and lightly browned. 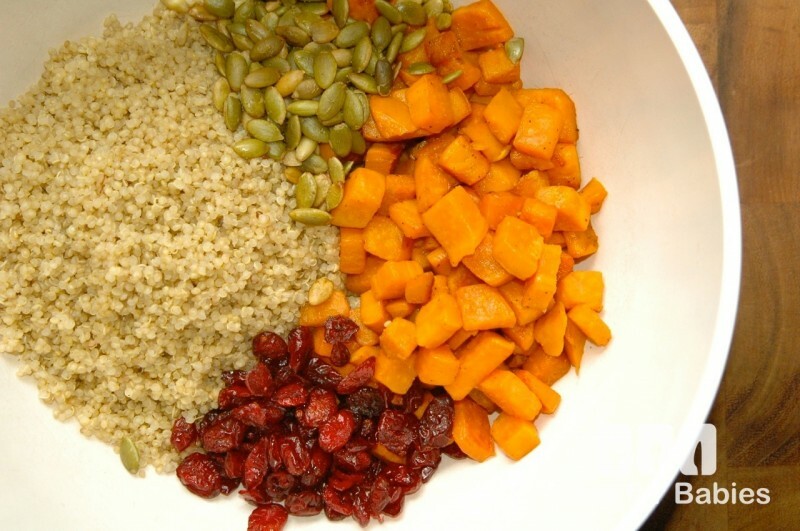 Transfer all the ingredients to a large bowl (if adding pre-prepared quinoa, heat through once combined or heat the quinoa before mixing the ingredients together). Pour in the vinaigrette and stir to fully coat the salad. Serve warmed, garnished with additional dried cranberries and pepitas. If desired, garnish with crumbled goat or feta cheese. Store in the fridge in an air tight container for 2-3 days. The longer is sits, the more time the flavours have to combine! This looks awesome. I bet that the cranberry’s give it incredible flavor too. Yum! 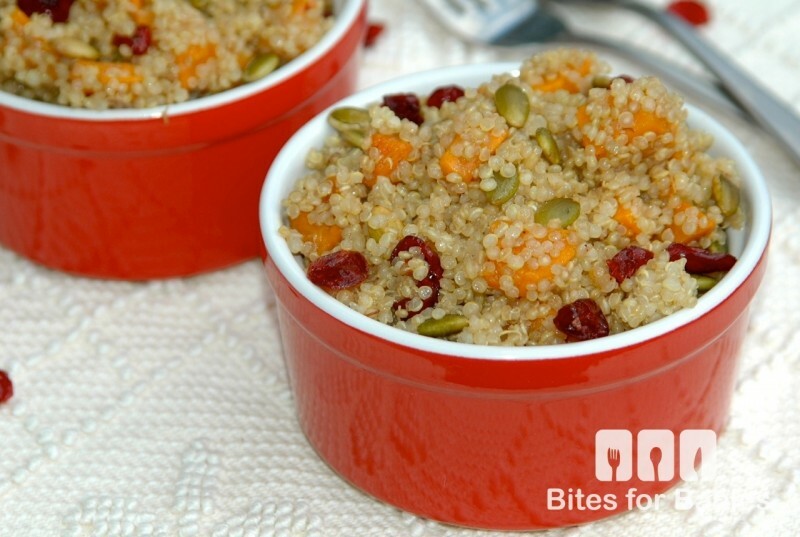 They do…the chewy bits are nice compliment to the crunchy pumpkin seeds. 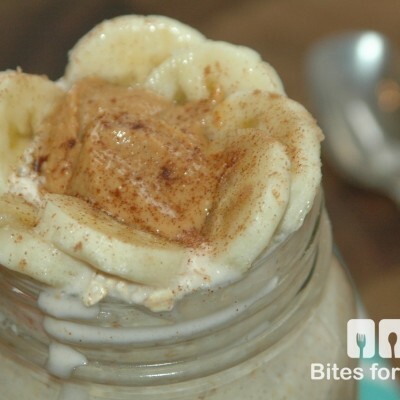 You could also substitute them with raisins or goji berries. Sounds so delicious. I first had quinoa a few months back and loved it. I’ll have to try this. I think it’s pretty easy to get addicted to! I actually prefer it’s flavour to that of rice and pasta. 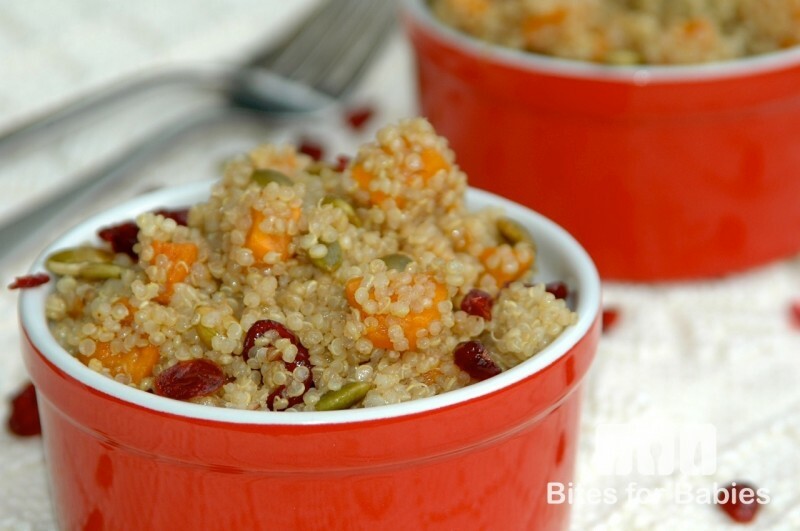 I think some dishes just taste better made with quinoa!